“I’m not a racist but….. The appointment of fascist Paolo Di Canio by the Sunderland Association Football Club board as manager gives North East football fans of SAFC and NUFC the rare opportunity to unite in common cause. “Di Canio has the opportunity to clarify his views and let us know what his approach will be and how his strongly held views will influence how he will do his job. It would be hypocritical of us [at FARE] not to point out his self-proclaimed fascist past when we are outraged by Lazio fans when they make the Roman salute, which we all know has been made famous by Hitler and the far right. The press has managed to find some SAFC fans who want ‘the club to be put first’ and ‘only think of football.’ Just as there were NUFC fans who looked the other way over WONGA. The fence sitters should take another look at the issue and see what is at stake with the appointment of an open fascist at a working class club like SUNDERLAND. 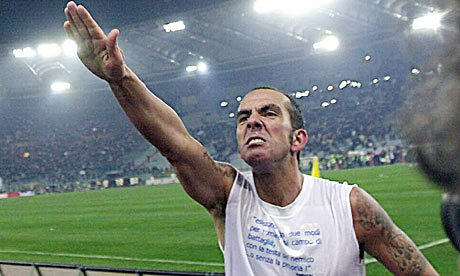 Undoubtedly Di Canio has held and expressed fascist views and sympathies as the Telegraph article shows. Someone who has a tattoo glorifying Il Duce doesn’t leave you in much doubt as to his position! Given the ConDem war on the working poor and the rise of racist and fascist groups like the EDL it is disgraceful that Di Canio is appointed manager of a club like Sunderland. Lest we forget the role of fascism is to act as an iron fist against the Trade Unions and to smash and atomise the organisations of the working class to make it easier for big business to impose their will on society. North East Labour MPs and Trade Union leaders should be up in arms. Let’s here some questions and condemnations in Parliament. Meanwhile fans of all allegiances and colours need to get organised. There should be be a UNITED campaign of SAFC & NUFC fans and all regional point scoring should be avoided. It is not the fault of ordinary SAFC fans that Di Canio has been appointed. NUFC fans would do well to remember that. Di Canio’s whinging press statement in which he claims to be ‘hurt’ at criticism over his views is obviously an attempt to back peddle on his views (money talks!) but he needs to be pushed further. Saying he is not racist is not enough. Have you ever met a fascist who wasn’t also a racist? We need to demand he makes a clear statement as to whether he is or isn’t a fascist. If he sticks to his despicable anti-working class fascist views he can’t manage a club like SAFC. Bottom line. LATEST NEWS: Durham miners will ask for return of banner from Stadium of Light unless Di Canio says he is not now a fascist.